Editor’s Note: My friend Lilly is writing this because I am too busy and she loves the idea of blogging! There is the joke that when a man suffers a midlife crisis he buys a sports car. Following my divorce I decided to go ahead and indulge my own near midlife crisis by packing it all up and traveling. Inspired by something I read in book club about traveling women, I figured why not? If they could do something different, I could too. (In fact if enough women start expressing their midlife crisis via travel maybe we can develop our own cultural stereotype). However, being a middle-aged, American woman and not a young free-spirit backpacker type I knew I would need some structure in my daily life. I did a lot of reading and a lot of research before deciding on Thailand as my destination. It was far away, would be a fairly drastic culture change but wouldn’t be too far off the beaten path. Since I am a city person I figured I would start in Bangkok, the capital and most famous city in the country. I was a little overly ambitious and via the web I signed up for cooking classes, language classes and Thai boxing classes before I even boarded the plane. I even prebooked all my hotels. Normally, I am not so nuerotic and I just book the first few nights but I was so excited by the trip, that I booked my whole trip right away. I need it. I spent four nights in Bangkok and then three nights in Phuket. I finish my trip with a beautiful Ko Samui hotel right now the beach. I was amazed at how cheap the hotels were. In fact everything from the hotel to the cooking class was really affordable! Upon arrival I found that I had underestimated just how exhausting adjusting to normal life in a foreign country would be. I struggled through two days of Thai boxing before giving that up. I stayed in my language classes longer but was by no means a star pupil. However, my cooking classes became my real love and obsession. 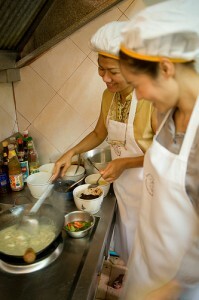 There are now over 40 different cooking schools in Bangkok. Most of them are reputable but do your research before choosing one. Most schools teach in English but dishes, styles and prices vary. I chose a school with an informal environment that was near where I was staying and ended up loving it. Probably due to my Southern childhood some of my favorite dishes included fried chicken in Pandan leaves and deep-fried fish cakes with seasonings. My best friend laughed when she heard wondering why I had to go all the way to Thailand just to deep-fry chicken and fish. To my credit I also learned to both prepare and enjoy hot n’ sour prawn soup and coconut rice with mangoes. At first I was fairly wary of the prawns and had my doubts about mango as a desert but grew to love both of these dishes. One great thing about learning to cook in another country is that it forces you to learn to shop in another country. I didn’t just hop in the car and go to Wal-Mart like I would at home. In order to prepare these dishes with fresh ingredients I had to learn to figure out the world unto itself that is the Thai market. Thai markets for the uninitiated are a truly amazing experience. My first time there I experienced sensory overload from the overwhelming number of stalls, colors, smells and people. But after a month of cooking school, I was weaving my way to my favorite produce stall right along with the locals. My trip was a success; it certainly broke me out of my routine and helped me build my confidence. It wasn’t specifically where I went or what I learned but just the act of doing something- that was important for me.